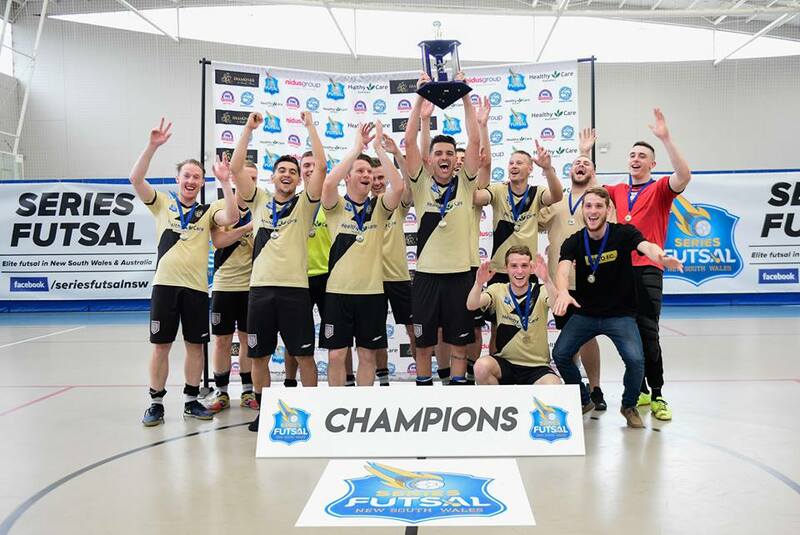 Congratulations Minto FC on becoming the inaugural Series Futsal Grand Final Champions and clinching a spot in the next edition of Series Futsal Australia! See the full match review below! With the biggest match of the year finally upon us, the crowds flocked to Emerton Leisure Centre to watch the inaugural premiers the Indigenous All Stars take on runner-up Minto FC. This was the clash everyone was hoping for, and the heat outside was only matched by the fire inside the players minds as two red-hot sides clashed head on. The Indigenous All Stars are blessed all over the court with natural ability and athleticism, but without a doubt it was the key trio of speedster Daniel Fogarty, the silky target Shervin Adeli and one of the best to ever pull on the green and gold for Australia, Lachlan Wright. Throw in the likes of Shayne Ardle, Greg Kondek and Joshua Ross and you have all the ingredients for a powerful, well disciplined unit that don’t only play for each other, but represent their culture and community formidably. Minto FC on the other hand have their own triple threat with pivot Dean Lockhart providing a calming influence, lightning quick flanker Mark Symington who contributes at both ends of the court and the nimble left footer Danny Martinez who has the ability to pull something out of nothing. Minto FC were without coach Scott Gilligan and their top goal scorer Anthony Haddad, but turned to the likes of Haim and Conor Irwin in goals, as well as Shaun Irwin, Harry Bagot and Marko Filipovic who, on his day, is unstoppable. So the scene was set as both teams marched out onto the court, with the All Stars having the bigger crowd, they headed into the game as slight favourites after winning the league. Grand Finals are often slow, dour affairs with neither team wanting to make a mistake, but these two teams about to throw caution into the wind and go against the stereotypes to serve up a final that will be talked about for years to come. All Stars kicked off, and had the better of the opening few minutes but some slick passing from Minto early on showed they weren’t intimidated by the pressure. I few early fouls flew in from both sides, with Symington, Adeli and Martinez being on the receiving end. It was one foul on Martinez in particular, on the left had side of the All Stars ‘D’ that would be telling as Minto set up a set piece opportunity. Symington played the ball square and with dummy runs from Irwin and Filipovic, Martinez slotted from the top of the ‘D’, making on mistake, 1-0 for Minto. Irwin and then Ross then traded great chances, both slotting wide. But it was soon 2-0 after Minto strung a few passes together, and seemingly from nothing Bradon Clissold played a ball into the back post where Shannon Fielding improvised, scoring off his hip. Shortly after Bagot left Kondek for dead on the sideline, only for his shot to cannon back off the crossbar. After some great pressure from the All Stars they were threatening to pinch a goal time and time again and finally they got their reward, after a wayward pass out of the back by Lockhart, the All Stars pinched the ball and Lachlan Wright mustered up all of his experience to calmly slot home past Conor Irwin to make it 2-1, a cheeky nut-megged finish being all it took to open the scoring for the Premiers. A great move out of the back ended with Symington playing in Fielding, who beat his player only to slam his shot against the upright. Although Minto were creating the better chances, the All Stars were dominating periods of the match and Fogarty, Adeli and Kondek looked dangerous every time they had possession of the ball. With both sides on 5 fouls the first half was set for a nervy finish, especially as All Stars moved their defensive line into Minto FC’s face, forcing them to play long balls, often misdirected handing possession over. A smart kick in from Fogarty found Ross, but his spectacular spinning volley just went over Irwin’s goal. A swift couter attack from Minto saw Fielding yet again beat his marker, slide the ball to Clissold who showed the awareness for one extra pass to allow Bagot to put his shot home with a scuffed effort for 3-1. Adelia looked to reply straight away with a great turn and pass for Wright, but Minto scrambled it clear. Fogarty was causing havoc down the left hand side beating players like they weren’t even there but the All Stars couldn’t find their last pass, and Minto nearly made them pay after Fielding hit the post again. A sloppy challenge from Clissold on Fogarty allowed Shervin Adeli to have a 10M spot kick, which he smashed home into the bottom right hand corner, bringing the game back to 3-2. Shortly after another clumsy foul, this time from Adeli on Bagot gave Minto the opportunity from the 10m spot, with Symington also hammering home, albeit off the woodwork into the bottom left corner, 4-2. Lachlan Wright was next to hit the post, his trusty left foot couldn’t guide the ball home, and that sent the sides into the break at 4-2, with all to play for after a riveting first half of quality futsal. Shortly after Lachlan Wright was at it agin working down the left flank before flipping the ball into Adeli, and when he has his back to goal he becomes more dangerous as he swiveled his hips and the Minto defense scrambled to stop him, he unselfishly squared the ball up for Joshua Ross who fired his shot goal wards, only for it to be blocked on the line by Danny Martinez with his hand. Reminiscent of Luis Suarez in the World Cup, Martinez was lucky to receive no booking at all, but Adelia now had the chance to score from the 6m penalty spot, which is almost a foregone conclusion when this man is on the ball. Adeli blasted it to Irwin’s right, but the Minto ‘Keeper got down well and saved, as well as saw the ball over the sideline. Irwin wasn’t finished yet, and made a quadruple save from Fogarty, Adeli and Ross twice in the space of ten seconds. Fogarty and Adeli at times, were playing by themselves as their link up play continued to provide chance after chance as the All Stars took the ascendancy but were made to wait after continually being denied by Irwin. But against the run of play, a Minto counter attack lead to a corner, which Symington dispatched past Curmi for his second of the Final and gave Minto a 5-2 lead. With 8 minutes to go the dynamic of the game changed. The once unbeatable wall of Conor Irwin was breached by Daniel Fogarty, who capitalised on a Minto FC mistake to streak clear onto his less favoured left foot but he angled his shot, as he has done so many times before, into the back post for a lifeline for the All Stars. Fogarty was a man possessed, pressing up the court with no self regard for his own energy levels and he was rewarded when he beat Bagot again down the sideline, and squared it up for superstar Shervin Adeli to slot home into an empty net to make it 5-4. Coming out like a cyclone for the last few minutes, All Stars had all the momentum and it seemed all the energy as Minto saw their comfortable three goal lead dwindle away. Both sides traded chances, but it was the All Stars who would get the crucial goal to send the game to extra time. It was that man Shervin Adeli who picked up a perfect pass from Lachlan Wright, and as mentioned above, when Adeli has his back to goal he is lethal, beating a trailing Symington challenge and using his body to roll around Shaun Irwin, he put the ball through Conor Irwin’s legs to send the crowd into raptures and the game into extra time. As extra time started the All Stars had the better of the first five minutes, and although both sides traded chances the All Stars would feel unlucky not to take the lead, one particular chance to Fogarty after a neat lay off from Adeli flashed wide was golden but sadly for the All Stars, couldn’t put them in the lead. When the second half of extra time started, Martinez and Filipovic were telepathic in their play as Martinez ended up controlling and smashing the ball into the top corner to put Minto into a 6-5 lead. All Stars then replaced Curmi with Ardle in goals and went for the power play. All Stars looked dangerous with the extra man advantage but the risk outweighed the reward as Shannon FIeding pinched a ball from Adeli, but hit the post with the goal gaping, but his team mate Lockhart made no mistake as he scored from his own half to seal a dramatic 7-5 win for Minto FC to be crowned the inaugural Series Futsal NSW Champions. Minto FC (Martinez x 2, Symington x 2, Bagot x 1, Lockhart x 1, Fielding x 1). Indigenous Allstars (Adeli x 3, Fogarty x 1, L.Wright x 1).